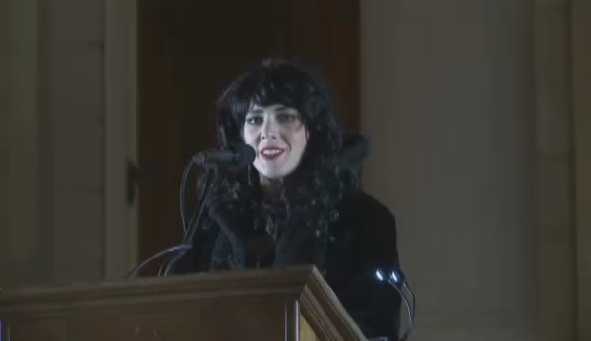 Blackmore, who recently made headlines for blogging her Thanksgiving Day abortion, spoke against the efforts of Christians to preserve the biblical definition of marriage and to end abortion. But some expressed concern over the gathering as they stood outside of the event holding signs such as “Repent and believe the gospel,” and preached the word of God to attendees. “We’re a Christian nation. We don’t worship the devil. And I just intended to try and maybe talk to them about Jesus because He’s the answer,” local resident Floyd McDeavitt told local television station WILX. He said that the nation is headed in the wrong direction. December 22, 1820, in celebration of the 200th anniversary of the Pilgrim landing at Plymouth Rock, American statesman Daniel Webster spoke of how the Christian faith was the basis upon which the nation was founded. “Let us cherish these sentiments, and extend this influence still more widely; in full conviction that this is the happiest society which partakes in the highest degree of the mild and peaceful spirit of Christianity,” Webster declared.